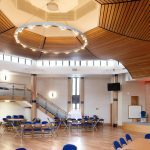 Mill Hill Synagogue in London has completed the construction of a new community centre to replace a pre-existing facility which had been outgrown by the 1,000 plus families that meet and use the site. 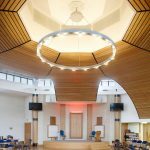 The Ner Orre (lamp of light) Centre is a Farrow Silverton designed project that includes a custom made Spectral chandelier which illuminates the dome at the heart of the main function room. 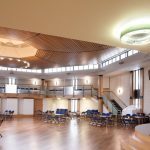 The £3.2m building was funded by donations from its members and the centre is made up of a central function room that seats up to 600 and a secondary hall on the lower level, along with six classrooms and youth lounge. 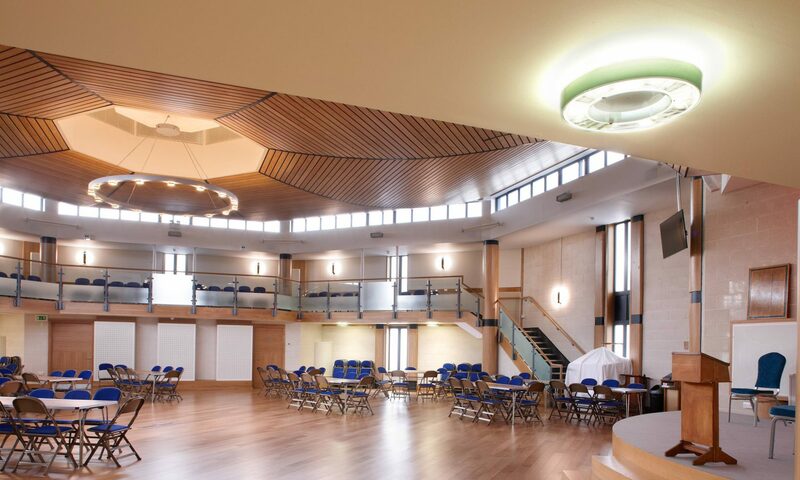 The centre is used for a number of community events including fundraisers, group meetings and dinners. 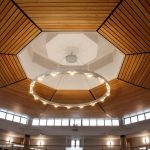 In the roof above the main hall, architects at Farrow Silverton designed a dome section with waves of wood panelling feeding into the space, forming an octagonal frame around the dome. 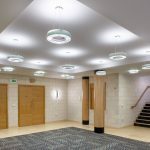 Spectral Lighting’s Ralph Stockham became involved in the project when architect Leon Silverton, along with electrical contractor Ian Cousins (Cousins Electrical) and consultant, David Smart, set about lighting the standout feature. At the heart of the system is the characteristic H-shaped profile extrusion which can be shaped and suspended to any form and length. At Mill Hill, Ralph has included a feature so staff can raise and lower the fitting for cleaning and, when required, easy access for servicing. 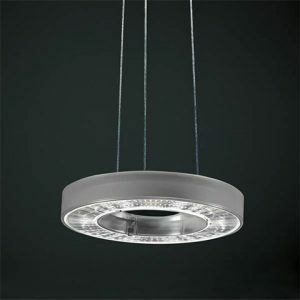 Once the extrusion track was shaped to size at Spectral’s German factory, LED components selected from the vast Spectral range were fitted to provide both direct and indirect lighting. The components selected for this project were the acrylic Pergament blocks from Spectral’s range. These create a subtle downlight effect from the 15w SLM LED modules housed in the underside of the track. 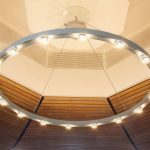 Further to this, on the upwards facing channel, there are 3w linear LED chips that create a gentle uplight effect to the dome. All the drivers and heatsinks for the LEDs are also housed discreetly within the extruded track, maintaining the clean lines of the structure. The result is the contemporary chandelier that presides above the space at Mill Hill. It provides the required functional light without dominating the wood panelling or detracting from the dome above. 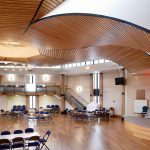 The H-Profil fitting designed and produced for the Ner Orre Centre is the first fully bespoke fitting that Spectral has made for the UK market. 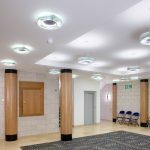 While having to meet the challenges of the design and dimming requirement, it’s a showcase of the system’s potential. 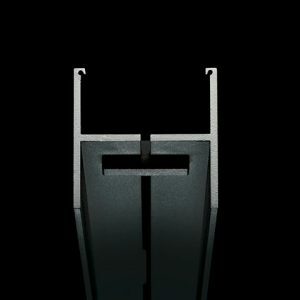 A true one-off product, H-Profil is ideally suited to architecture projects where the structure is too demanding for standardised luminaire designs. H-Profil bends the rules. It encourages creative freedom for architects and embraces bespoke design. A second phase of lighting has been specified for Ner Orre and following the success of the H-Profil design, a number of matching luminaires are scheduled for production. 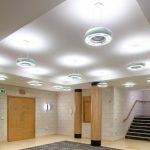 Phase two will welcome matching luminaire of lower diameters to the centre, continuing the design aesthetic across the entire premises.